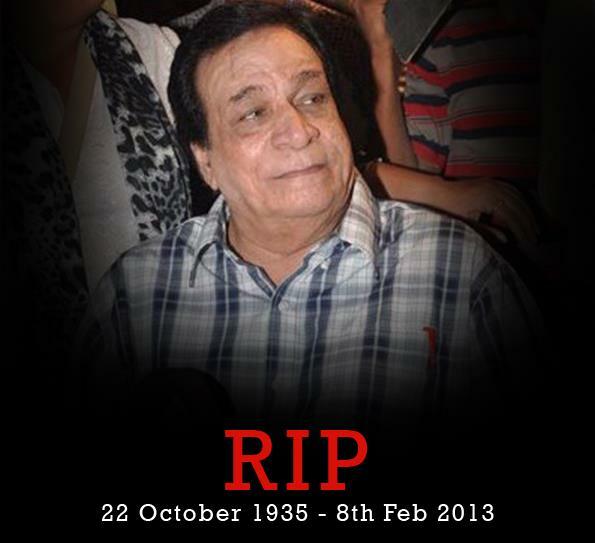 Kader Khan Passed Away - 8th Feb.2013 ? Kader Khan and says his family is really upset with rumours about his death doing the rounds on the social-media sites. The 77-year-old has urged gossip mongers to stop spreading rumours. “My family is extremely upset about it. They are very worried. All this has shaken my family. Whoever is spreading such rumours, please stop it,” Kader told IANS. “Ek din toh sabko jana hai aur main aap sabki duayein lekar jaunga. Right now I am completely fine,” he added. He has performed in 450 above Bollywood and Urdu and has written dialogues for over 250 Hindi movies. He has played a large variety of parts in films like a supporting role of a father, uncle, brother, main villain or the side villain, guest actor and comedian.